It is a generall upon all Occasions and may be given att all times when you do not know what ye desease is in any of ye aforesaid Liquors. The dose for a man or Woman is from one Scruple to two Scruples and a boy or girle twelves or fourteen graines in Convenient Liquors A drink to Stanch blond inwardly Take ye juyce of Shepherds purse. parsley five-finger of Each one handful. five slips of Egrimony Strain all these - juyces into ye milk of a red cow and drink these of early and late warm. 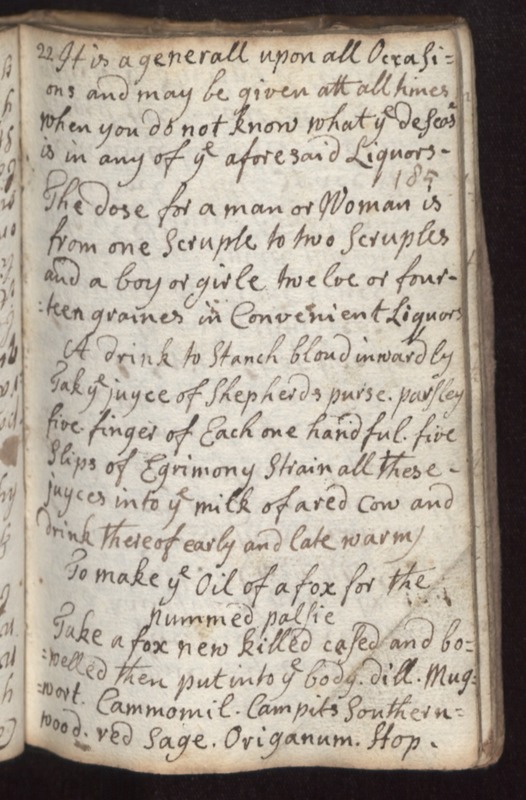 To make ye Oil of a fox for the nummed palsie Take a fox new killed cased and bowelled then put into ye body. dill. Mugwort. Cammomil. Campits Southerwood. red sage. Origanum. Stop.